Above left: Crew installs Acoustifence at Coca Cola plant in Bay City, Michigan. 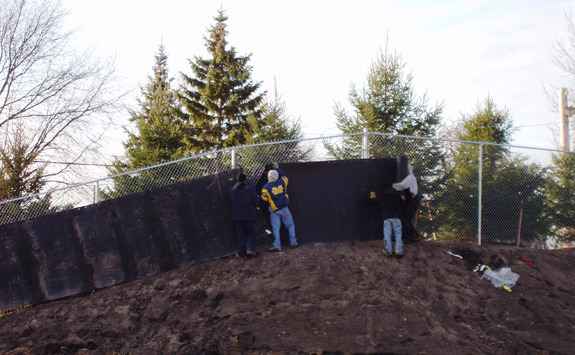 Above right: Completed noise barrier berm featuring Acoustifence. 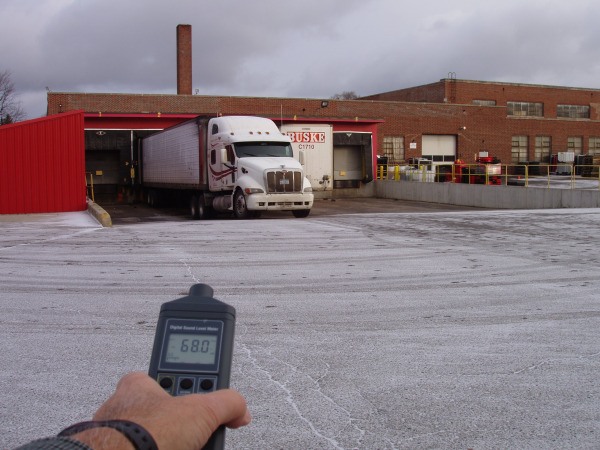 After installation of Acoustifence, decibel readings at the Coca Cola plant dropped from 89 to 68 decibels (left); and at the adjacent residence, dropped to 42.9 decibels (right). BAY CITY, Michigan, January 12, 2012 – Coca-Cola has completed installation of Acoustifence® noise barrier fencing along the west perimeter of its Bay City plant, bringing to an abrupt halt those noise issues that had been plaguing neighbors in the surrounding community and attracting local news organizations as the outcry from area residents grew. Architect Jack Zelazny of Dearborn, Michigan, acting as a consultant to Coca Cola’s contractor Kirco Manix, chose Acoustifence noise barrier fencing for the core of the 300-foot wide noise barrier project designed to alleviate noise from idling delivery trucks at the plant that had been plaguing neighbors in the South End Community. Zelazny said the initial plan was to construct a 30-foot acoustical metal fence along the perimeter roadway to address the problem, but he nixed the idea in favor of something significantly less expensive and more aesthetically pleasing and to the community’s residents. 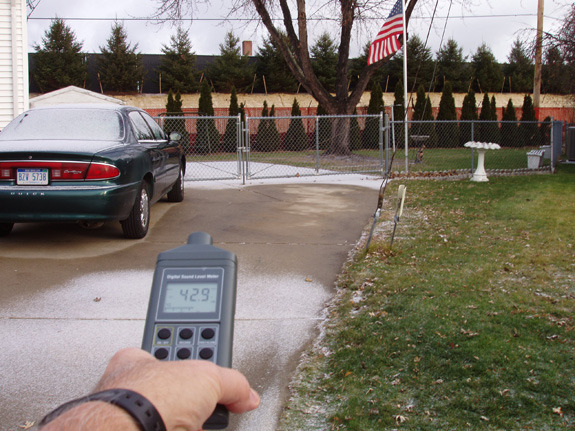 After researching sound barrier fencing options, he found Acoustifence, a product of Acoustiblok, Inc. in Tampa Florida, and discussed his options with acoustical consultant Paul Getts of Acoustiblok. After conferring with Getts, Zelazny moved ahead with construction of a grass covered, 300-foot wide berm that incorporated a nine foot high Acoustifence barrier and landscaping for an attractive roadside aesthetic. The project was completed in the final weeks of December, and both company officials and neighbors rang in the New Year with their new found peace and quiet. “The Acoustifence went up flawlessly, and it’s not unpleasant to look at,” Zelazny said. “When we covered it with the dark green acoustical fabric covering, it looked natural and organic, as we had hoped. “It exceeded my expectations, I think it exceeded everyone’s expectations,” he said. “The people at Coca Cola are happy with it, and most importantly the neighbors in the surrounding community are happy with it. For more information on Acoustifence, visit the Acoustiblok website, email sales@acoustiblok.com, or call 813.980.1400.